I'm a dress girl all the way, but sometimes I can't resist a cute pair of shorts, especially if they have polka dots. I've decided that polka dots are probably one of my biggest weaknesses when shopping, it's getting kind of ridiculous the amount of clothing items I have that feature this cute little print. Lately I have been so obsessed with black and white with a splash of red in it (as if you can't tell from my new blog header). At least this seems to be a good color combo to transition from Summer to Fall in before we all start to get really into oranges, deep reds and shades of brown. I wear this antique-gold necklace by Calico a ridiculous amount. It just seems to go perfectly with almost every outfit! You can buy the Matte Gold one HERE. I don't buy accessories very often, so when I do I have a tendency to cling to it and add it to as many outfits possible. Hope you all have a wonderful Thursday, one more day until the weekend! Those shorts are adorable and you look so ridiculously good in red! This outfit is so cute! I really love those shorts and red is the perfect color to pair with them! polka dots and red always look so cute together! I totally understand your weakness for this print. You look so cute! Great top and necklace! cute look, totally like it! 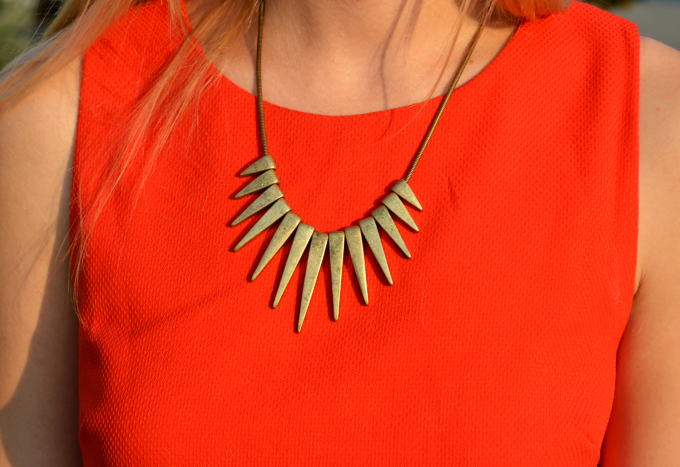 Love the spiked necklace! A little bit of edginess to the otherwise adorable peplum and polka-dots. So cute! This outfit is absolutely adorable!! Love the polka dot shorts..
oh my gosh. this is one of my favorite outfits of yours EVER. First thing I said when I saw this outfit post "OH THAT IS SO CUTE!" Lol I love this outfit! I'm in love with polka dots too!! Love your outfit! It's so so cute and sassy! I LOVE those shorts. Love me some polka dots! Gosh dang, girl! This is seriously a bold look. I love the red, and the polka dots, and the gold... all the best and brightest of fashionable things you've got going on here, Miss Chelsea! Ugh, I would love to raid your closet one day. red looks really nice on you!